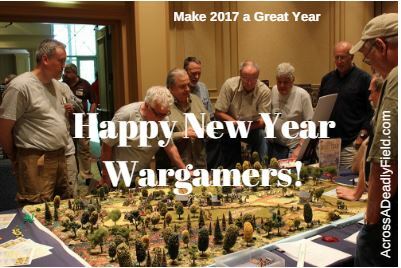 Across A Deadly Field: A Legacy to John Hill > Blog > About John Hill > Happy New Year Wargamers! It has been an eventful year for our family. My son, Anthony, John Hill’s grandson, graduated from high school. One of the things that Anthony said when my mother and I took him out for his graduation day luncheon at Red Robin was, “I wish Grandpa was here to see me.” It bought a small tear to mine and my mother’s eyes. I told my son, “No worries, I know Grandpa is in Heaven looking down on you right now and he is extremely proud of you…..” That seemed to make Anthony feel better knowing that, but I have to say that, “Yes, I wish my Dad were here too.” And not only did Anthony graduate from high school, this past fall he went off to college at Northern Arizona University with a full scholarship nearly. When my mother and I were getting Anthony settled into his dorm room, Anthony once again commented that he wishes Grandpa were here to see him moving on to the next phase of his life, transitioning from a child to a young man, and I once again reminded him that I was certain Grandpa was somewhere looking down on his only grandson and beaming with pride. I have become more active on Facebook and Twitter recently and have had the pleasure of connecting with many of you. I have enjoyed reading your stories to me about how you knew John Hill or how you became interested in wargaming or where you first spotted Squad Leader on the shelves in a small local hobby shop or a friend of yours introduced you to Johnny Reb for the first time and you were hooked from then on. Your stories would always warm my heart and put a smile on my face. Thank you for taking the time to reach out to me. We miss my father very much and we know you all do as well. I am sure the wagraming conventions this past year were not the same without my father facilitating one of his games with his voice that would carry across the room. Thank you also to those who have sent me photos of events held at the conventions memorializing my father, John Hill. Keep those coming, because they are appreciated. Within my increased activity on social media, many of you may know I have been advertising and selling many of my father’s wargame rules, books, miniatures, magazines, etc. Many of you have already purchased some of his items. There are many more which will be coming soon. So if you are interested in some of my father’s inventory be sure to try and look for me on some of the wargaming Facebook groups. Also, there are some of things on E-Bay. For instance, you can a copy of John’s ADF: War in the West book on e-bay where I have it listed for much less than where you will find it elsewhere. You can also get a copy of the Johnny Reb Miniature Rules for the War Between the States for which I am only asking a starting bid of $8.00 and it ends today, so you have an opportunity to purchase items that belonged to my father for a very good price. The reason why I am pricing them far below their value, is because it is more important to me that these things go to a good home where they will be treasured as opposed to trying to get top dollar for them. I know some of you have asked me for a master list of everything that we are selling of my father’s, such as Cory Ring and many others of you. I am presently working on that list and I will have it ready as soon as I can. These things do take time as I am sure many of you may be aware. As mentioned, I have been connecting with some of you via the Facebook Wargaming Groups and it was Rob Prince who mentioned something to me about a Johnny Reb book that was signed by many of the wargamers at a convention wishing me Happy Birthday and good wishes. I had no idea what he was talking about. He thought that I had just forgotten, but I know that is not something I would have forgotten, because I would have remembered that. I am not saying that my memory is all that sharp, bit that I would have recalled. Anyways, as it turned out, it was never mailed out to me, but when I contacted the one who was supposed to mail it out, I received a very sweet and embarrassed apology and told that it was immediately being put in the mail. I am delighted to say that I did receive it yesterday, so instead of it being a birthday present, as my birthday was in May, it was a New Year’s present and I love it. Thank you Norris Darrall for my New Years present. It will be treasured always. And please, no more apologies. You are wonderful! Love to you, Margarette, Scott, Ronald and Rolland and all of the grandkids. Both my mother and I were reading over it and it bought tears to our eyes. Thank you so much to each of you who signed it. I will be talking more about this in another post, because I will be listing all of the individuals who signed it and thanking them personally as well as creating a scanned image of the signature page and uploading it to this website. That is all I have to say right now, but I do want to wish everyone a very happy new year and look for me on social media where I will be selling my father’s books, miniatures, etc. Once the master list is created, I will be giving Cory Ring a copy so it can be posted to the JRIII Yahoo Groups and I will also post it to Facebook as well as to this website. I know many of you would love to have something that John Hill painted or designed himself and we would love to see it go to good homes where it will be treasured and used for years to come. Thanks for the update! I still have a couple 10mm houses that John painted in my collection, and I think of him whenever I get out my gaming figures. Thank you Scott. I am really glad to hear you have some of the 10mm houses he painted. I am not sure if you are following me on Facebook, but I am selling many of figurines. Let me know if you would be interested.